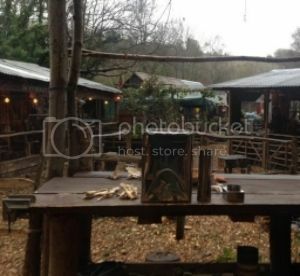 I had been looking for a new wood burning stove for camp cooking for some time. Cooking and heating water over the open fire is great but it can get expensive on fuel. Even though I have access to a lot of wood its surprising how much as I can go through in a weekend. 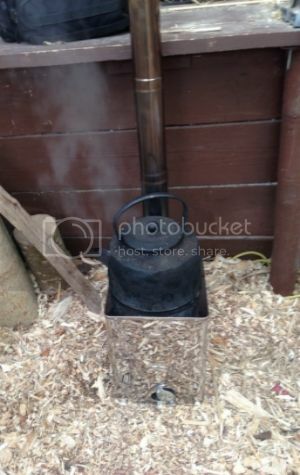 After searching the web I decided that I wanted a gasifier stove that would be efficient and yet be able to heat my workshop and provide the quantity of hot water I need to make endless cups of coffee. 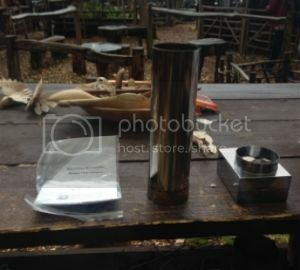 The SilverFire® Hunter, is a lightweight, portable natural draft chimney stove designed for both indoor & outdoor use! The Hunter is a top lit updraft gasifier (TLUD), powered by twigs, yard scrub, or any flammable biomass (why buy fuel?). TLUD’s stoves utilize a batch fed combustion chamber. It is simple to operate. Just top light it like a candle, no continuous feeding required. Vent the chimney outdoors to eliminate all household emissions. Insert vertical positioned fuel into the combustion chamber; next place a little tinder on top and light! To fine tune your flame adjust the ventilation door at the bottom of the stove. That’s all there is to it! The portable SilverFire®Hunter model opens up a new frontier in biomass clean cook stoves. You now have the capacity to eliminate all household emissions! 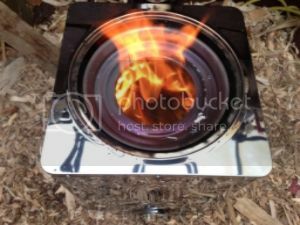 My first impressions of the Hunter stove were very positive. It’s hard to ignore the “oh Shiny” appeal of the Hunter Stove. 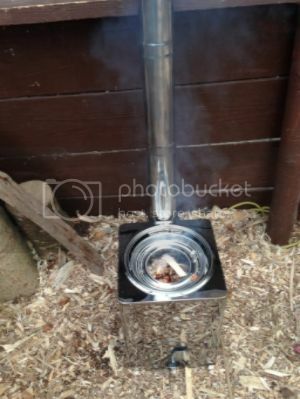 It is marketed as an indoor and outdoor stove using the supplied chimney. All the parts fit nicely inside the Stove Body. The whole package has a nice robust feel of quality to it. Silverfire state that it’s a great product for use in a disaster situation and I can see that its main design focus is as a cooking stove. Stove Package in the box next to my daypack for comparison. The Silverfire Hunter is easy to light and is fairly lightweight as wood burning stoves go. Obviously it’s not designed for backpacking and I would probably not take it on canoe trips due to its size. I may in the future make a bag for it so I can protect it in an open boat. 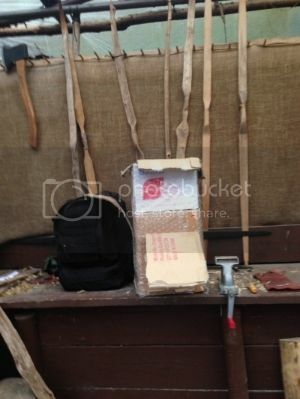 Silverfire do sell bags for the Hunter. The stove is easy to assemble with each part fitting together neatly. Each chimney piece is numbered which is a nice touch and the elbow joining the chimney to the stove fits nice and snug. The chimney feels stable even in a breeze. The Hunter is a TLUD stove this stands for Top Lit Updraft Gasifier. 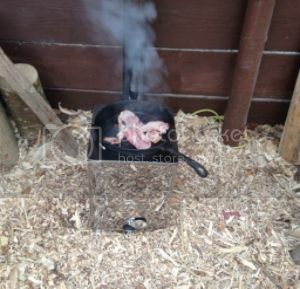 A bit of a mouthful but in reality its very simple to use, I put a some shavings from the floor into the stove followed by some split wood and then a hand full of shavings on top. Then I lit the top shavings with a match. It took a little fiddling with the air intake to get the flow right but once going the energy output is good. Fuelled Ready For the First Burn. One Match and plenty of heat. Just like a Kelly Kettle, to get the maxim heat output in a minimal time it is best to use smaller diameter fuel to really throw out the heat. The stove comes into its own once up to temperature and a kettle on the top. This forces the air through the stove from the intake and ensures all the combustible gases are burnt off. With a bit of practice very little smoke is produced from the stove. During the first couple of uses I found I was using a lot of fine kindling to keep it going. With practice I got the hang of using the small sticks to get it started and then thicker material to slow down the cooking process, which is great for use with my Super Potje. The stove really does burn almost all of the fuel so very little ash remains. I did find it very tricky to separate the sections of the chimney when dismantling, the first couple of times I used the stove. You really have to wait until the unit is completely cool and have a firm hand. 5 litres of water to the boil in no time. You cant make bows without a bacon sandwich. Ø Easy to light and is adjustable. Ø The stove is quite large when packed. Ø You have to wait for the stove to cool and invert it to remove the Ash. No Ash tray. I was quite excited to receive the Silverfire Hunter as a Christmas present to myself. The rationale being that the cost of the stove would be offset by the reduction in the amount of firewood I have used. It is easily transported in the back of a car from site to site and at 14lbs it’s not too heavy to carry into the woods. This year I want to use it to heat a tarp shelter. I have been using the stove for just over a year and it is just as shiny and clean as when I first unpacked it. I can’t see why this stove will not be fully operational for years to come. 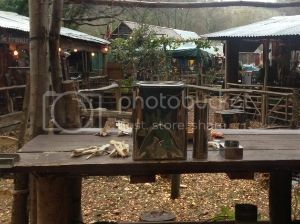 Silverfire do a number of accessories for the Hunter Stove so I may well be placing another order sometime soon. I like the idea of the iron lid. 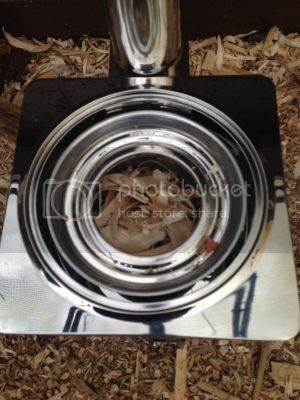 Value for money - 4/5 Pricing $219 plus shipping for the basic stove.